SCADACore’s turnkey packages provide clients with a one-stop solution to all their remote monitoring needs. IIoT Live Boxes provide interfaces with serial, ethernet, and usb devices, providing real-time control and monitoring to field devices and operations. SCADACore can work with existing communications wireless or wired to retrieve data. For applications where communications do not exist we can provide a turn-key and custom solution to meet your needs. All wireless equipment needed to set up your remote monitoring infrastructure. SCADACore Com Packages provide all wireless equipment needed to set up your remote monitoring infrastructure. Modems are provided pre-commissioned and ready to install. No configuration is necessary. Antenna, Lightning arrester, cables, mounts. Packages are engineered to work in the harshest northern environments through the winter. Local alarm station allows users to have a redundant alarming system. The local alarm station allows users to have a redundant alarming system. Local alarm thresholds can be set on the local touchscreen or remotely via SCADACore Live. The alarm thresholds allow the users to trigger local sirens and beacons on the alarm station. At the same time any breaches of alarm levels will immediately trigger an increased poll rate push to SCADACore. SCADACore Live has independent callouts set up for text and email allow additional “remote” users to alerted at the same time as local users. 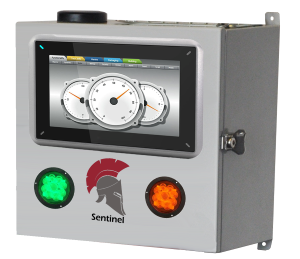 Contact the SCADACore team for a information or pricing on a sentinel package? Do you want to know where your assets are? Do you need to know how your assets are operating? Do you need remote security to ensure the safety of your products and personal?